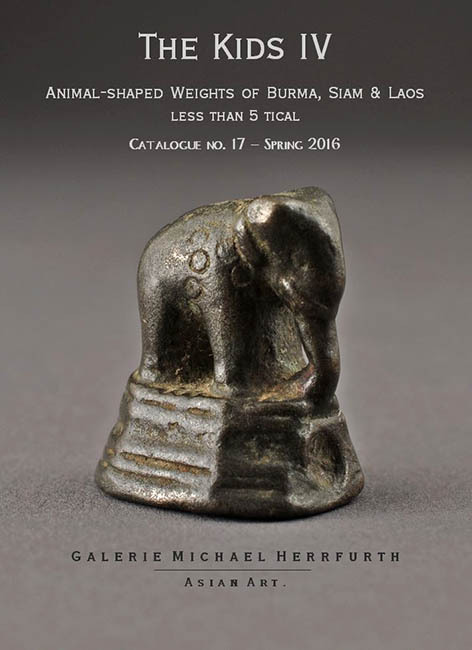 Galerie Michael Herrfurth - Opium Weights & Asian art. 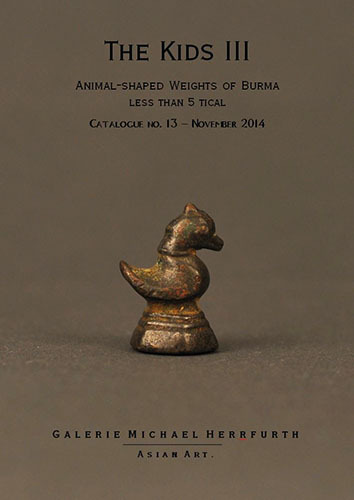 A s i a n A r t .
Welcome to our Collection of Animal-shaped Weights of Burma. 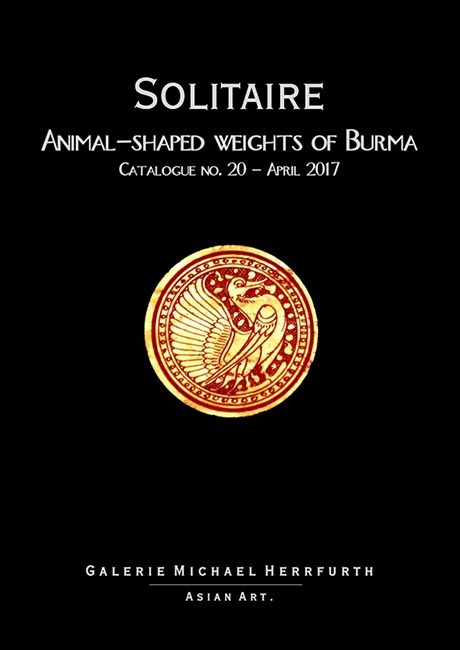 In our showroooms (7 pages) we offer Burmese animal-shaped weights (Opium Weights - Opiumgewichte) as well as weights from Siam and Laos. 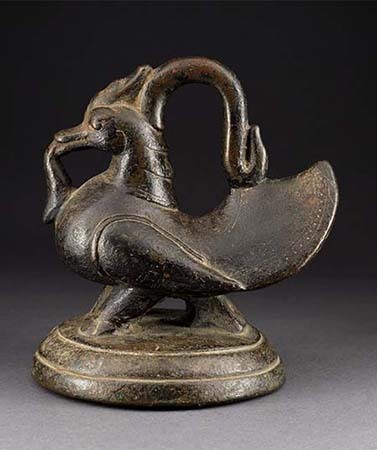 Although rare to find, we are still able to offer a wide range of original standard weights of the Burmese Empires in good to excellent condition. All our offers you'll find with a short description, detailed images in various views, information about the standardform, estimated age, size, weight, and price. For delivery inside the European Union we need to add 19 % VAT. Delivery outside EU is free of VAT. Please let us remind you to pay attention to customs and tax regulations in your country. 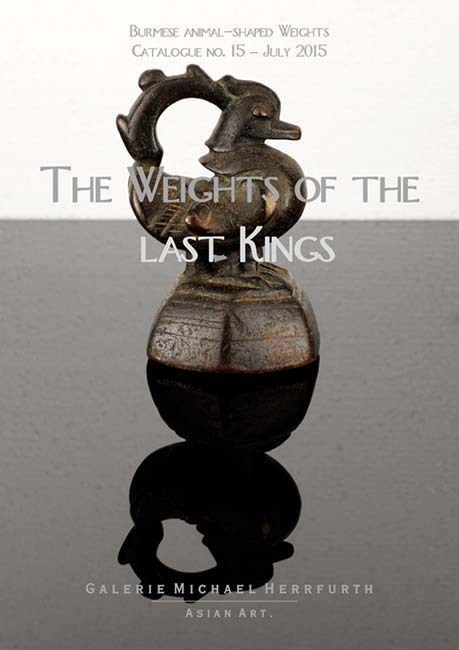 Photo gallery - To study the weights (weights are not for sale). The weights, displayed in these galleries, are not available anymore. The image collection should give you a possibility to study the different shapes, sizes, weight masses etc. In the contents (next page after click the image above) you can choose the period and the standardform you are interested in. 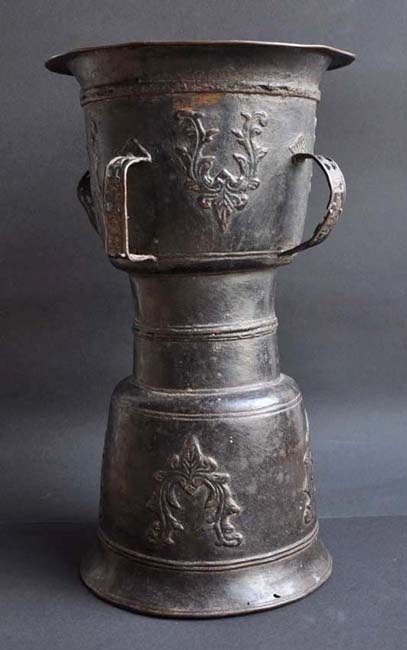 Silver objects from Burma, Laos and Siam. 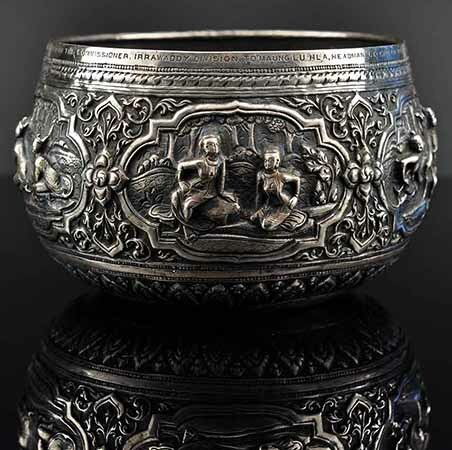 A small selection of silver objects from Burma, Laos and Siam shows the high standard of excellence of the silversmith's from Rangoon, Mandalay or the Hmong in Laos. 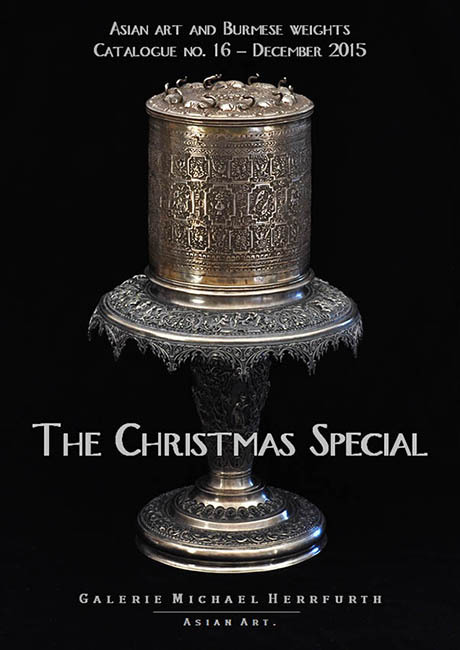 Our Silver Collection offers Burmese bowls (Thabeik), lime boxes (Hton Bu), Hmong bangles, ear-rings and various other finely crafted objects, often made of high-grade silver. 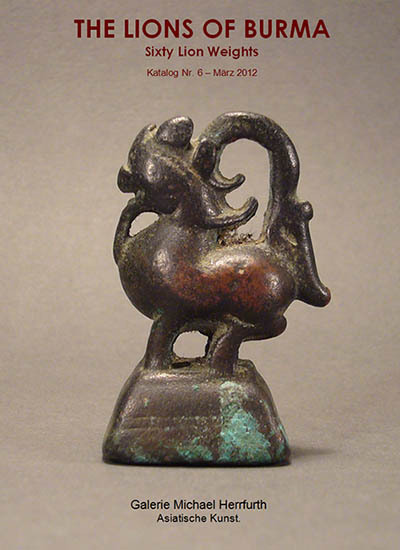 Lacquerware from Burma and the Shan-States. Burma has remarkable rich artistic traditions - lacquerworks are one of them. 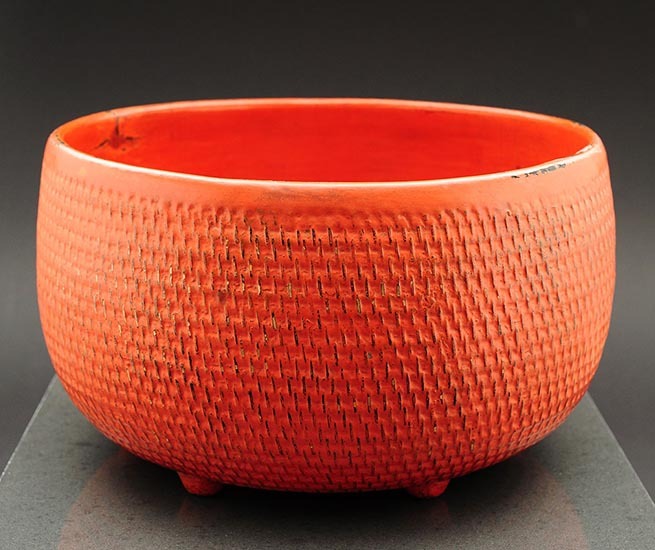 We offer a few bowls and boxes, made between the late 19th and early 20th century. 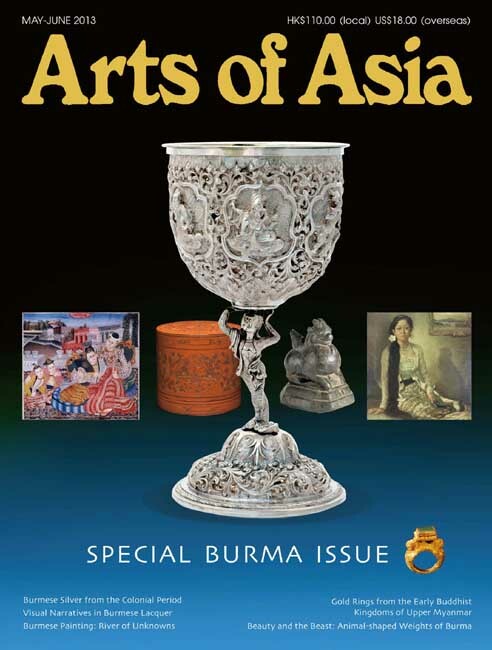 All the descriptions of the items are based on excellent reference books, such as Sylvia Fraser-Lu Burmese Lacquerware, Ralph Isaacs and T. Richard Blurton Visions from the Golden Land and - particularly recommended - U Than Htun (Dedaye) Lacquerware Journeys. The Manuscript and Sazigyo Collection. Kammavaca / Kammawa-sa and Sarsekyo / Sazigyo binding ribbons. 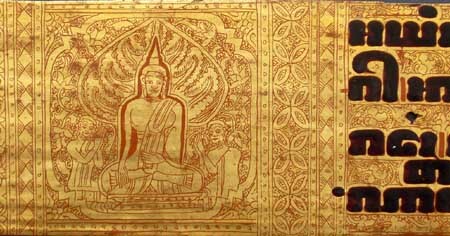 We offer a few Kammavaca manuscripts from Burma (Mandalay, Shan States, Mon-State), Kammavaca-wrappings (Sa-pa-lwa), a small collection of Sazigyo / Sarsekyo binding ribbons (some are dated) and - occasional - palm leaf manuscripts from Ceylon (Sri Lanka) and Nepal. 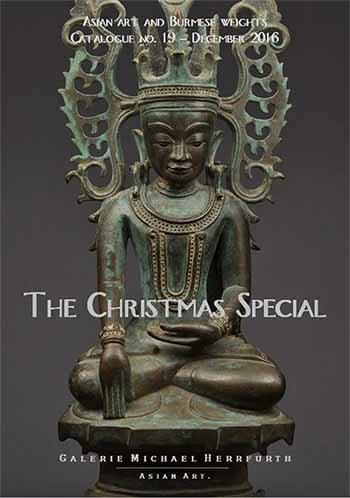 Buddha images and religious art works from Southeast Asia, e. g. Burma (Ava, Kongbaung, Shan States, Tai Yai), Thailand (Ayutthaya / U Thong, Rattanakosin), Laos, China. 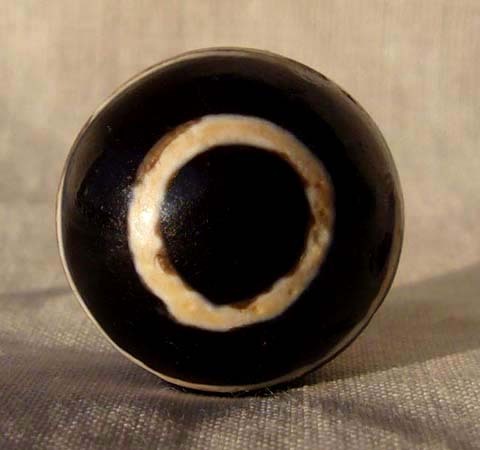 Ancient and antique beads from Southeast Asia. Here you find a small but fine collection of rare ancient beads, such as Dzi-type Pyu Pumptek, tradewind beads from Southeast Asia, etched carnelian Pyu-beads, glass beads from Chin hills, antique Conch shell beads from Nagaland etc. 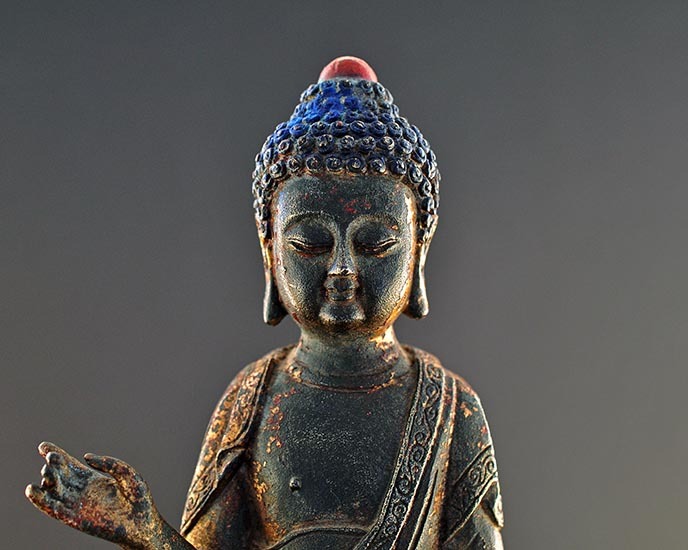 Our gallery offers a wide range of selected Asian fine arts and antiques. 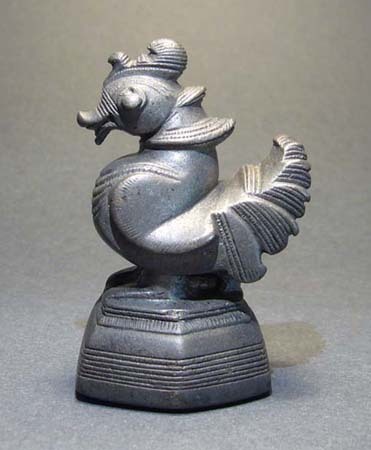 Please browse these pages to find Mokko kettledrums from Alor (Indonesia), Dong Son rain drums from Yunnan and Laos or Karen Frog drums, silver art works from Hmong people, tribal art from Nagaland, antique Betel-nut cutters from East Java and much more. 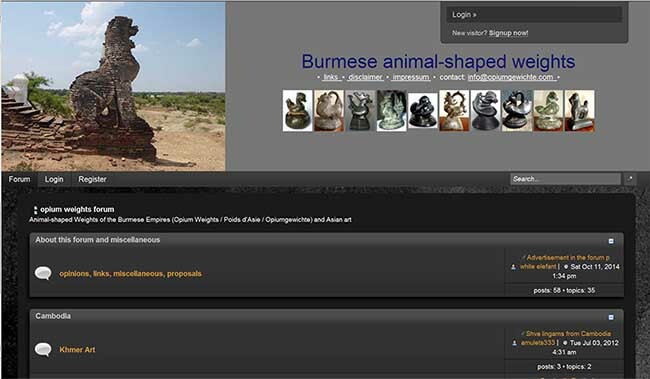 Important publications about Burma, Burmese and Asian history and Arts. 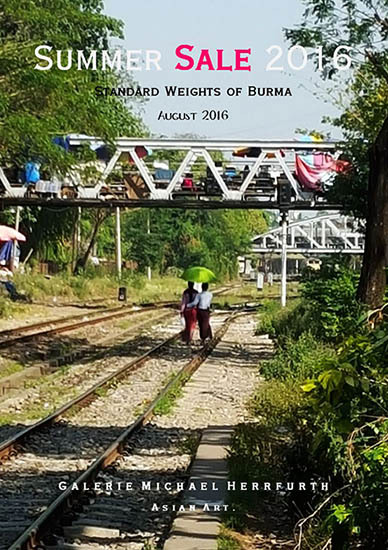 Over several years we collect rare antiquarian books, antiquarian popular scientific journals and out of print literature about Burma and Asian art. 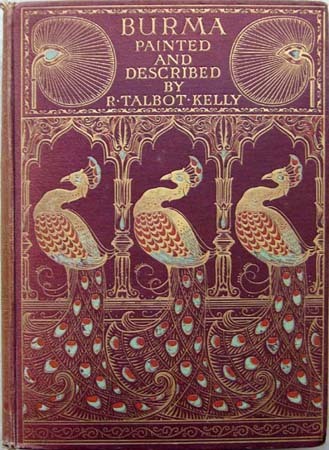 All the books and journals are used. Please ask for the condition and further images. The vintage Postcard & Photo Collection. 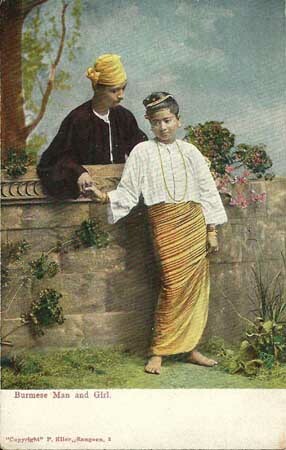 We offer a selection of original vintage Burmese postcards showing images made by famous photographers of the late 19th and early 20th century such as D. A. Ahuja and Philippe Klier (Rangoon), postcards by Raphael Tuck & sons and others. 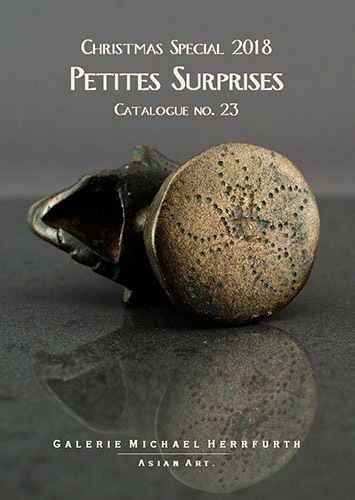 The Catalogues 2011 - 2018. 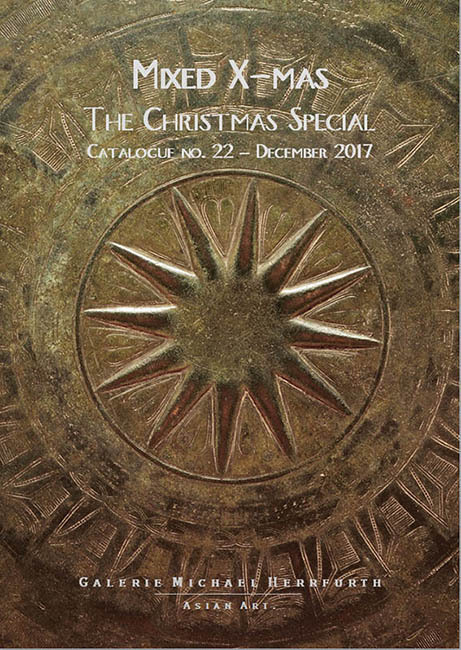 Since 2011 two or three times a year we publish a catalogue with the latest and special offers (only online, print-outs resp. paper copies unfortunately not available). 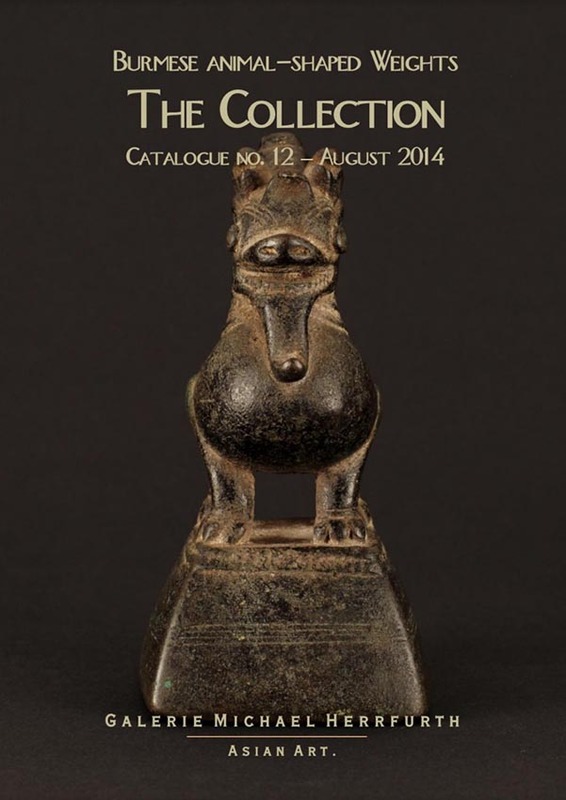 In the archive you will find all the catalogues since 2011. 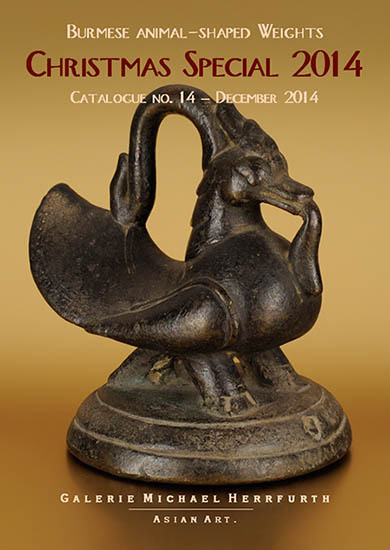 Most of the pieces from the past catalogues are sold, but if you are interested in one of these items, please ask. A few items are still available. 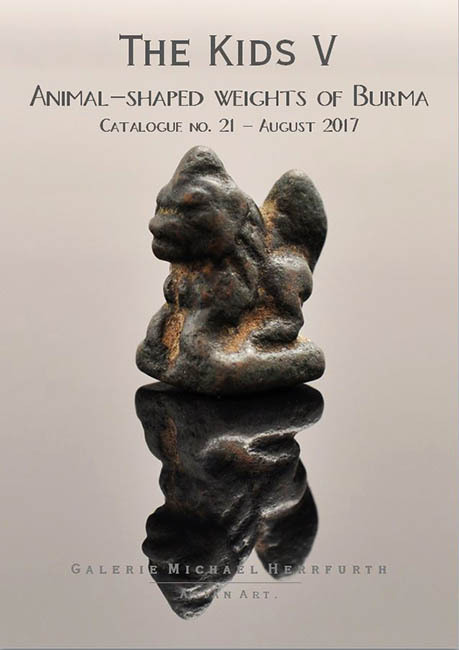 Already in 2007 we established the Opium Weights Forum as a platform to exchange our knowledge, information and pictures about the Burmese weights and other topics of southeast Asian art and crafts. Since 2008 more than 100'000 people from over 100 countries visited the forum. You will find various sub-forums here with many threads. You are invited to participate, ask your question, post pictures of interesting pieces from your collection or simply follow the discussions. We kindly ask you to keep your postings free of advertising.